After two days of rains and a clear blue sky, I decided to visit Banganga Tank – My first visit. How I reach Banganga Tank? The nearest railway station to Banganga Tank is Grant Road. After reaching Grant Road I walk towards West side to climb skywalk to walk few meters till I reach â€“ Â stairs towards Chowpatty. Once on road, I walk nearby Gamdevi Police Station (Estd. 1917) on right side, cross two red lights to reach Wilson college. Cross the road > turn right > walk straight approx 2 km following beautiful sea waves/shore to reach Teen Batti at Walkeshwar. Little more walking to reach Shri Ghanshyamdas Sitaram Poddar chowk. After crossing the chowk there are two paths. Right side path is towards Banganga Tank. It is approx.Â 30 minutesÂ walking time from Grant Road railway station till Banganga tank. You may hire a taxi or a B.E.S.T. bus. I prefer walking specially when the area around is nice & beautiful. Banganga area is one of the oldest living area in Mumbai. Banganga tank is a rectangular tankÂ with manyÂ temples all around it. Lampposts are at entry point. Lots of ducks inside the water as well at tank stairs and also fish inside the water. One can see High-rise buildings at little distance. In short – a mixture of modern and ancient times at the same location. Banganga Tank is a rectangular tank -Â 135 meters long, 52 meters wide and 10 meters deep at the centre. It is said Lord Rama on his way to Lanka in search of Sita, halted at this spot to seek the blessings of Sage Gautama. Lord Rama to quench his thirst shot a Baan (arrow) into the nether world and released the Bhogavati, the underground Ganga, thus the Banganga. Under the sage’s advice, Rama worshipped Lord Shiva, whose Linga was brought from Kashi (Varanasi) everyday by Lakshmana. One day the Linga counld not reach the site in time for the daily puja. Rama then fashioned a Linga from the surrounding sands and performed the Prana Pratishtha (Life creating ceremony). The Temple built on this spot was then called ‘Waluka Ishwar” (God of sand) and over the years came to be known as Walkeshwar. 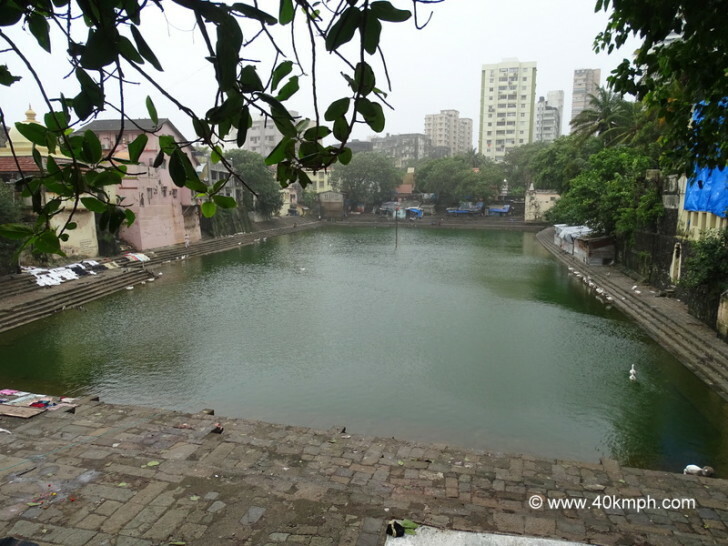 Banganga tank dates back to Silahara Period (from 810 to 1250 A.D.) and was repaired in the Yadava period. Some of the earliest settlers were the Gaud Sarawat Brahmins. I did a parikrama (walk around) at Â Banganga Tank and sat on stairs for approx. 30 minutes. Immense silence. I am happy I did a pilgrimage in Mumbai. Lots of Bhel Puri shops are at Banganga area. While returning I stop at Punjabi Chandu Halwai Karachiwala (Estd. 1896) and had Kesar Rasmalai for Rs. 31/-. Delicious it was. And nearby Wilson College in front ofÂ Bharatiya Vidya Bhavan I had one plain dosa (Rs. 20) and cutting chai (Rs. 6). Thus the journey was completed. One should visit Banganga tank if touring or visiting Mumbai.